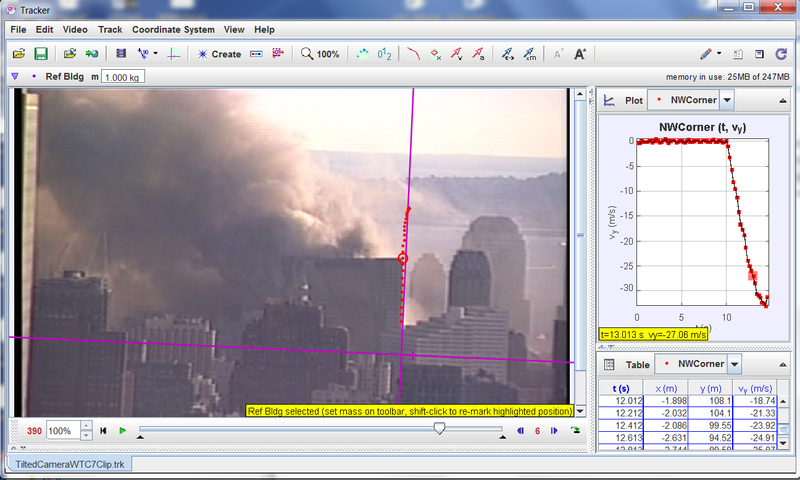 This is a measurement of the downward acceleration of WTC 7 using Tracker, which is a free, open source program, part of the Open Source Physics project. That comment astounded me because I see the motion of the building as such a straightforward measurement. But upon reflection I recalled all the time and energy and collaboration that went into gathering all the necessary materials and information for the measurement: a suitable video, an appropriate software tool to make measurements on the video, calibration data, knowledge of video formats, etc. I realized that even with the requisite knowledge base and skill set, it would take a very motivated person to reproduce my measurements. I therefore collected together all the bits and pieces that went into my measurement and present them here as a kit that can be used by a physics teacher or handed to a motivated physics student as a lab assignment or project or science fair entry. The skills that will be learned in the process will serve a physics student well for other projects that might involve using video as a measuring tool. There is nothing particularly difficult in this measurement, but some familiarity with the concepts is necessary to understand the significance of the results. As I explained to one professor, this is a straightforward measurement of a publicly observable event in the public sphere that is sufficiently anomalous to arouse anyone’s curiosity. Observing and measuring what is before your eyes is not political and should not be seen as controversial. This should be legitimate fare for students at any school or college, public or private. Deciding to not observe and/or not measure something and/or to criticize someone for making a measurement because of the feared political ramifications of the result, is in fact a political statement. The goal here is to present about a semester of introductory physics in one web page, an impossible task if there ever was one, so if it is not entirely successful that’s why. If you’ve had a little physics it may help put the various ideas in context for you. Kinematics is the study of motion. Motion involves the basic concepts of position and time and specifying position as a function of time. Putting dots on the frames of a video with Tracker or Physics Toolkit, or similar software is an exercise in kinematics. The rate of change of position with respect to time (how fast something moves) is called velocity, which is very close to the idea of speed. The difference is that velocity is a vector, which means you have to keep track of direction as well as the speed. Vectors are represented as arrows. The length of the arrow represents the speed. A velocity vector changes if either the direction or the speed changes. The rate of change of velocity is called acceleration. It’s how fast the velocity changes. For this “micro-course” we restrict our attention to one dimension (straight line motion), so we don’t have to worry about the distinction between speed and velocity. If you increase your speed from 0 to 60 mi/hr in 10 seconds, you are gaining speed (accelerating) at a rate of 6 mi per hr per sec. Note that there are two different units of distance mixed together there. This is equivalent to 8.8 (ft per sec) per sec. The unit of acceleration (ft/sec/sec) is abbreviated ft/sec^2 (where the ^ indicates an exponent in klutzy typewriter notation. Read it as ft per sec squared). In metric units the unit of acceleration is m/s^2. It’s how much the speed (measured in m/s) changes each second. Bottom line: Kinematics involves the quantities: time and position, and a sequence of quantities derived from these (i.e. derivatives of position with respect to time): velocity, acceleration, jerk (which is the rate of change of acceleration with respect to time), etc. on up the line. For simple problems, such as cruising down the highway, velocity might be constant with all the higher derivatives equal to zero. For slightly more complex problems acceleration might be constant, with the higher derivatives equal to zero. This is the situation when a rock falls under the influence of gravity near the surface of the earth. Gravity causes falling objects to accelerate (speed up as they fall). As long as air resistance is not significant, all freely falling objects accelerate at the same rate: 32 ft/s^2 or in metric units 9.8 m/s^2. (This varies slightly depending on how far you are from the center of the earth. It’s slightly less on a high mountain. It’s slightly less at the equator because the earth bulges at the equator so you’re farther from the center.) In New York City the acceleration of gravity is 9.802 m/s^2. A falling rock would increase it’s speed by 9.802 m/s each second. In the absence of a net force (i.e. if all forces acting on an object balance out to zero), an object at rest will tend to remain at rest, and an object in motion will tend to remain in motion at a constant speed in a straight line (i.e. constant velocity). The first part of this is easy to accept, but the second part is counter-intuitive for most people until they educate their intuition. Time for a quiz. Q: You’re driving down a long straight road at a constant 60 mi/hr. There are forces opposing your motion (friction and air resistance) and there is the force pushing your car forward. Which must be larger? A: Most people who haven’t fully absorbed Newton’s First Law will say the forward force must be greater, because deep down in their souls they believe it takes some force just to keep moving. What Newton’s First Law spells out, however, is that it takes zero force to keep moving in a straight line at a constant speed. Any excess force in the forward direction would make you speed up, and any excess force in the backward direction would make you slow down. What you’re doing when you keep your foot on the accelerator pedal to go a constant speed is balancing the forward and backward forces. It took an excess forward force to get you up to speed, but it takes zero net force to maintain your speed. One of the deep implications of Newton’s First Law is that you can’t tell if you’re moving or not. That’s why you can function normally while flying at cruising altitude. It feels like you are at rest. In fact as the earth spins, people near the equator are traveling about 1000 mi/hr. We are all traveling at about 66,000 mi/hr as we orbit the sun. Yet we feel ourselves to be at rest. Maintaining your position requires no force. You can’t tell if you’re moving or not, so constant velocity requires no force. In the chain of derivatives of position with respect to time, Force and Mass come into play at the level of acceleration. If an object experiences a net force, it will accelerate. The acceleration will be in the direction of the net force, proportional to the net force, and inversely proportional to the object’s mass. As worded here, we could say a = F/m. This is usually turned around to read F = ma. If you attach the same outboard motor to a row boat or a battle ship, we would see that equal forces do not cause equal accelerations. The battle ship resists acceleration due to its larger mass. This tendency to resist acceleration is called inertia. Mass can be thought of as a measure of an object’s inertia. Newton’s First Law is called the Law of Inertia because objects will not accelerate if there is zero force acting on them. If you hold a rock in the air, gravity and your hand provide opposing forces that balance out, so there is no net force and therefore no acceleration. If you let go, the force of gravity becomes an unbalanced force, so the rock accelerates downward. If you drop a rock with twice the mass it has twice the inertia, but the force is also twice as great, so the acceleration is the same. Therefore all objects moving under the influence of gravity alone accelerate downward with equal accelerations. Therefore we can talk about THE acceleration of gravity. All objects in freefall (bowling balls, buildings, etc.) will accelerate at THE acceleration of gravity (for that spot on the earth). If they encounter resistance, however (due to air resistance, structural supports underneath them, etc.) the upward resisting force combines with gravity to produce a smaller net force, resulting in a smaller acceleration. If the upward force is actually greater than the weight of the falling object, the net force will be upward, so the acceleration will be upward. An upward acceleration for an object moving downward results in a slowing of the downward motion. All forces are actually interactions between pairs of objects. The forces the two objects exert on each other will always be equal and opposite. Q: You jump out of a plane. Gravity acts downward on you. What is the “reaction force” of the “action-reaction” pair? Newton’s laws of motion (all three of them) hold very precisely except for situations of extreme speed (close to the speed of light) or extreme gravity. These are situations where the laws of relativity are needed. For non-relativistic situations, such as falling buildings, Newton’s laws (all three of them, arguments of some “debunkers” notwithstanding) work very precisely. They are universal laws. All questions of motion can theoretically be answered in terms of Force and Mass by using Newton’s three laws of motion. However, it is often more convenient to reformulate dynamics in terms of “conserved quantities.” When you push on an object and cause it to move, you can describe what you’re doing as “acting on” it (exerting a force on it). But you could also think of this as “giving something to it.” The idea of “giving something to it” implies that what the object gained, the other object lost. Something is preserved (conserved) in the transaction. Work is defined as a force times the distance moved in the same direction during the interaction. If you shoot an arrow, the bow string exerts a force on the arrow through some distance. By so doing, you have changed the “state” of the arrow. We say we have given it kinetic energy. If you lift a bowling ball behind you, you are exerting an upward force through some distance, so you have done work on it. This work changes the state of the ball in a different way. We have lifted it higher in a gravitational field. If we quantify the amount of lift for a given mass in terms of the amount of work done, we come up with an expression we call potential energy. When the ball swings downward and rolls down the bowling alley the potential energy has been converted to kinetic energy. The work you did takes energy out of your body (that came from the last meal you ate), converts it into potential energy, which then is transformed into kinetic energy. Energy is a kind of bookkeeping system that allows us to talk about the work we do, the height of an object in a gravitational field, and the resulting motion all in common terms. There are many other forms of energy. Frictional forces feed into random molecular motions which we experience as thermal energy. As moving objects “naturally” come to rest, all the energy has been fed into the big sink-hole of thermal energy. A ball of clay thrown across the room has kinetic energy. All of the molecules share the same motion. This kind of energy can do work (such as applying a force through a distance to break a window). If the lump of clay hits the wall and “stops,” the molecules are still moving, but randomly. The randomization of the motions has made the kinetic energy of the molecules less accessible to do work, so we say the entropy of the system has increased. This is getting into thermodynamics.